You might not even realize that your home requires electrical repair services until your power breaker trips. So you go outside or in the basement and re-set it. You go back to what you were doing, and it trips again. Now it’s time to contact a reputable residential electrical service company and get to the bottom of it. The reason might be straightforward, or it could be quite complicated. The Boston area electrical services might take just a few minutes, or they could be very involved. Either way, maintenance repair services are needed to prevent an electrical fire or other hazards in the future. Electrical breakers trip when the circuit that is tied to a circuit breaker exceeds the safe parameters set by the switch. A sudden loss of power to a specific appliance or room within your home might be experienced, or a set of random outlets and fixtures may stop working. Whatever the situation, if you do not have experience working with electricity, your best bet is to contact a licensed, certified, and insured electrician in the Greater Boston area to inspect the situation and make repairs as necessary. What this means is that you likely have too much plugged into one circuit, which overloads the breaker, causing it to “trip” and stop working. All breakers have a safety limit of power that is used to supply the outlets, appliances, and fixtures in your home. Once this limit is exceeded, the breaker will trip. You might not even know that there is a potential overload until you try to use the microwave, blender, and dishwasher all at the same time. This is the term used to describe what happens when a hot or active wire comes in contact with other hot or active wires. In most cases, the homeowner will see a blackening around the outlet or even smell wires burning when this occurs. Hair dryers, electric space heaters, and even standard everyday appliances can cause this to happen. If this occurs in your home, do not interact with the outlet at all. 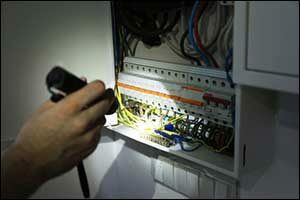 Leave the breaker tripped for safety and contact electrical repair services in the Greater Boston area right away. This type of situation is similar to a short circuit, but it happens when a hot or active wire meets a grounding wire. It results in safety issues with the grounding of an outlet, making it extremely dangerous. Follow the same guidelines as provided for a short circuit. Do not interact with the outlet, leave the breaker tripped, and contact your trusted Boston area electrical services immediately for assistance. If there is a lightning strike to an electric cable within your home or even near your home, it can knock out all of your breakers at once. In some cases, however, it might only affect a few. In most cases, this type of problem will resolve itself, but if your power does not come back on, it’s time to call a residential electrical service company. Don’t try to fix it yourself. Working in electrical storm conditions can be extremely dangerous. Wait for a professional. Power surges work similar to lightning strikes, sometimes knocking out all of the breakers at once. However, a power surge can also just affect a single outlet. To determine if a power surge was to blame for your outage or appliance issues, contact maintenance repair services at M Foley Electric. Our team can identify the problem and provide you with a solution to prevent power surges in the future. In some cases, it is the appliance itself that causes the overloading of the circuit. It might have worked great for years, but as the appliance fails, it causes issues with the breaker. If you have a brand new appliance, it could be a sign that the appliance requires more power than the circuit can handle. In that case, you will want to contact Boston area electrical services to upgrade wiring and increase the amount of energy that the circuit can handle to safely support the new appliance. This is common in kitchen remodeling projects, particularly in older houses. Whether you require emergency electrical repair services or if you want to make upgrades with a reputable residential electrical service company, you can trust M Foley Electric to get the job done right. Our team has many years of experience working with maintenance repair services and installations of residential and commercial wiring in the Greater Boston area. Give us a call at 1-857-829-0516 and speak with one of our agents about your concerns or requests for Boston area electrical services.